This rare Apothecalc computer was developed in a colaboration between New Specialties, Inc. based in Vidalia, Georgia and Texas Instruments. We know a similiar approach already from the Jeppesen Sanderson Avstar Flight computer, which is obviously based on the TI-35-II scientific calculator and its financial sibbling BA-II. But this Apothecalc computer designed for the use of medical personnel to perform apothecary calculations and conversions seems to be from a different world. We recogniced instantly the alphanumeric characters in the three left-most positions of the display and the [ENT] key. Dismantling this rare Apothecalc computer manufactured in November 1987 by Compal Electronics in Taiwan reveals an unusual construction with a Toshiba T9784 single-chip calculator circuit. We didn't discover any technical information about the Toshiba T9784 calculator circuit so far, but it seems to be similiar to the T9728 located in the Business Edge Financial calculator introduced in the same time frame. New Specialties, Inc. filed on April 7, 1988 for the Trademark of the Apothecalc logo, it was effective by November 15, 1988. About 7 years later, on May 22, 1995, the Trademark was cancelled. Please notice that Stokes Publishing Company in Sunnyvale, California, maker of the transparent "The Educator®" calculators, introduced in 1995 an Apothecalc calculator, too. 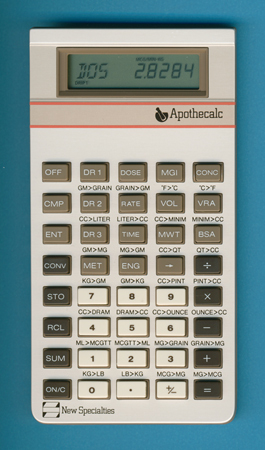 The APOTHECALC computer is designed for the use of medical personnel having a need to perform apothecary calculations and conversions. The computer is designed to be easy to operate and to allow the user to concentrate on the problem rather than on the use of the computer. The computer has three modes of operation. First of all it is a four function calculator; that is, it can add, subtract, multiply, and divide. Secondly, it can perform many commonly used conversions. Thirdly, it can perform a total of 11 complicated computations, such as determination of Body Surface Area and determination of the required drip rate given a desired dose, patient body weight of medicine dissolved in a known solution volume. When the computer is operating in the mode which performs these complicated computations, it will interact and „talk“ with the user via the display prompting the user to input the correct variables. The computer has been designed with several features to ensure than the data entry errors are not made and that, if they are made, they can be detected and corrected. It is the hope of New Specialties, Inc. That the APOTHECALC will assist the medical professional by providing a means whereby calculations can be made almost anywhere, quickly and accurately. Before using your APOTHECALC, please read this manual. We hope that the instructions and examples will quickly help you develop skill and confidence in APOTHECALC. © 1987 by New Specialties, Incorporated. © Joerg Woerner, December 23, 2010. No reprints without written permission.